When you are hosting a seminar or having a forum, you will be in real need of high quality and dependable simultaneous translation equipment. The problem with many of these is that the speaker systems are often a mess and jumble of cables. There are some new systems that are completely cable free and utilize the latest in state of the art wireless technologies. This infrared system provides the best quality audio sound courtesy of its higher frequency band. It is completely free of any distortion created by hall lighting. Because the infrared signal itself does not go through walls and other barriers, the system is entirely secure. This essential technology provides speakers with the coveted ability to move throughout the room and guarantees the privacy of their conversations. With a T35 transmitter, all of the complexities of audio installation are effortlessly removed. Setup could not be easier. The T35 even configures itself after you select from music, voice, or hearing assistance under the easy to use application menu. The system works well at a range of as far as a thousand feet. This makes the T35 itself optimal for stadiums, auditoriums, theaters, and other sizable venues that include a large coverage space. 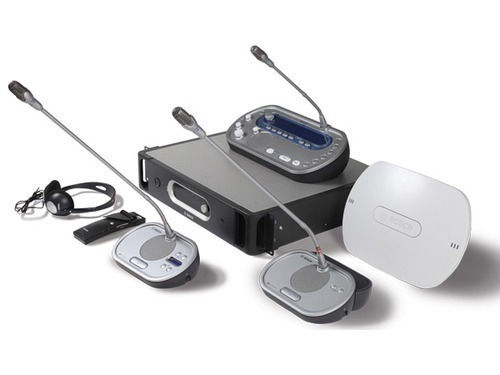 Bosch's CCS-800 system offers convenience, professionalism, and control to conferences and group meetings. Attendees are able to simply follow along with the meeting thanks to the loudspeaker sitting on a tabletop. The wireless microphone makes it easy to participate as necessary. This system includes an acoustic, digital feedback suppression system built-in to guarantee easy to understand speech acoustics. Bosch's wireless system proves to be an ideal solution for event spaces that are challenging. This system may be easily installed, operated, and even rearranged without a negative impact on the area of installation. The system itself does not suffer from cell phone interference or disturbances created by other types of equipment that utilize microwave, Bluetooth, or Wi-Fi signals. Even better, all of the DCN system signals are digitally enhanced against eavesdropping or tapping. Using one of these wireless and cable-free systems makes setup and take down so much easier. Besides this, it eliminates the risks of trips and falls, spills, or equipment tearing. Traditionally wired systems really do pose so many unnecessary hazards.